VisionAir indoor air cleaning systems help remove tobacco smoke and other pollutants from your business to contribute to a healthier living and working environment. Available with media type filtration or an electrostatic (ESP) filter, VisionAir systems are quiet, unobtrusive and easy to install. The VisionAir1 cleans up to 6,000 ft.³ and can be mounted on the wall, ceiling or onto a portable stand. The larger VisionAir2 cleans up to 12,000 ft. ³ and is mounted to or in the ceiling. Both models come standard with a convenient remote control so users can control airflow speeds from across the room. Easy Filter Maintenance—Choice of media or ESP filters allows business owners to select their preference of washable or replacement filtration options. Remote Control—Allows employees to increase or decrease airflow speeds as needed during peak and off-peak business hours. Low Noise Level—Quieter than an average PC on its lowest setting. 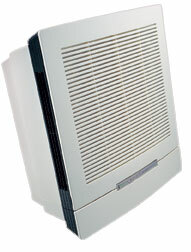 For parts, filters or service information on the Visionair® Systems, please call us.